Block Annoying Posts on Facebook - A Rose Is A Rose Is A Rose! Facebook has become an integral part of our lives. Most of us virtually live our lives on this social media platform. No exaggeration! I am sure, we all have experienced irritation at the things some people, actually our ‘friends’, do on Facebook . This annoyance is so much so that we can write blog posts or long status updates and garner support from a lot of like-minded people, oops ‘friends’ I mean. It is kind of funny that despite using Facebook day in and day out, most of us do not know that there are simpler ways of blocking these irritants. Today, let me share some tips to block annoying posts on Facebook so that your hatred for some of your ‘friends’ does not increase manifold and you have a perfectly happy and satisfying Facebook experience. Getting Rid of Unwanted Notifications : You congratulate a newly wed couple on their post and soon you are bombarded with 148 notifications. ‘X and A commented on the post you are following. P liked your comment. H mentioned you in a comment….’. Agree, this can irritate the hell out of you. Now, instead of ranting and spitting fire at these notifications, all you have to do is the following. To stop the notifications for the posts that you like or comment on, there’s a downward-pointing arrow located in the top-right corner of every post, click on that and select ‘Turn Off Notifications‘. 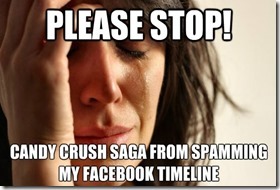 Banning those Candy Crush Saga Requests : Aah! This one is special. No game in the history of Facebook Gaming must have received so much of adulation and hatred at the same time. I think the number of Candy Crush lovers (I just checked some statistics and there are 93 million people who play Candy Crush DAILY!! Whoa!!) would be equivalent to Candy Crush haters. Now, haters, (of Candy Crush, I mean) why cant we practice the policy of ‘Live and Let Live’. Let the poor souls increase the pleasure chemical Dopamine in their bodies which is helping them to learn and training them to continue performing better. I think, they have a right to do that! Now, just do the following and let the gamers play in peace. To block the unwanted game requests, Go to Settings → Blocking → Block Apps → Type the name of the app to be blocked!! Simply click the downward-pointing arrow located in the top-right corner of that annoying post and choose ‘I don’t want to see this’ or click ‘Unfollow XYZ’. Just click on that Toxic person’s profile. You will see ‘Following’ icon, click on that and it will change to ‘Follow’. In other words you have ‘Unfollowed’ your friend and he/she will never know, and you won’t have to deal with his or her irritating posts anymore. If you don’t want them to see your posts, click on the lock icon on extreme right side of your Facebook wall, a drop down menu of Privacy Shortcuts will appear. Click on Who can see my stuff and then select Custom. A new window will pop out and Type that person’s name in the box for ‘Dont share this with’. Easy isnt’ it? 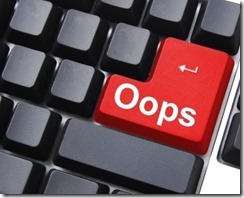 Amend your typo errors : Oh, we all make mistakes, (typing errors of course!) and then the T9 dictionary or predictive text can be pretty annoying too. And to make matters worse, we all proof read best after hitting the Post button. So, instead of correcting the word or the sentence in the next comment with a ‘Sorry 😛 Typo or Damn this auto-correct’. Click on the downward-pointing arrow located in the top-right corner, if it is your status update and the pencil icon on the right if it is your comment and select Edit. Voilà , you have a error free status or a comment. There are a lot of things we can do to have a rant-irritation-free Facebook experience, all we have to do is explore a bit. What annoying things have you come across on Facebook and how do you handle it? I know what you mean, Beloo. Thankfully with a few clicks we can get back our peace of mind on Facebook. 🙂 Glad that this post helped you! Aah! Hate taggers. For this very reason, I have turned on Timeline Review! You have covered the annoyances in Facebook pretty good, Shilpa. I find it annoying when my settings changes with FB changing its policies. After one bad experience I am pretty careful in monitoring my privacy settings. Oh yes, Facebook keeps on changing the settings and one has to be really vigilant about it! Agree with you. At one point of time, I was inundated with friend requests from such weird people. And that was because of changed privacy settings. I am very cautious now! I’ve just followed your instructions – No more Candy Crush invitations and no more random notifications. I can’t stop grinning. Thanks for the awesome tips, Shilpa! Thanks for such great tips, Shilpa. I am going to use that one to block games apps right away. I should have unfollowed a relative rather than unfriending her as I think she was a bit miffed. I sent another friend request that she didn’t accept. Oh well. I didn’t like knowing she was reading and judging my posts anyhow. So, now you know how to turn them off! Oh yes, there’s no dearth of judgmental people around us! I think that’s the favourite pass time for most! my fav on the list is the candy crush requests 😀 And those people who tag everybody under the sun…. Shilpa this is a great post. The candy c rush requestS are a big nuisance. You’ have given excellent tips to get rid of the sc caiied friends. Thanks for the tips, Shilpa! Blocking those annoying notifications is so necessary! I read the title of this post, groaned, “Oh, no! Another post on FB,” and almost skipped it, but finally decided to read it. I don’t know why I changed my mind, but I’m glad I did! Ah this post helps me so much! I knew of some of these,but,not all.I don’t think twice before blocking any annoying,derogatory,abusive post or promotional AD. Thanks for making me wise. Those notifications do get a lot annoying. Thanks for the tips… I will use them from now on :P.
Can’t thank you enough for this post Shilpa. Will use the tips ASAP. Especially i need freedom from that candy crush invites. I have come across all these problems, and I have also found ways to keep such irritating things away. It is true when we like something or comment on someone’s post/ picture, we are immediately bombarded with comments from their various friends. Sometimes, I have found even after blocking such things, FB somehow manages to sneak in one or two, but it is ok, we can get rid of them immediately. I don’t understand the logic of FB behind all such hangamas. I am sure they have had many complaints regarding such issues, but they are adamant. I am sure your blog would help many people who are struggling with such problems. Imagine we can’t even post a comment, without worrying about the endless notifications that will come automatically. Oh yes, FB keeps on changing the privacy settings etc. So, we have to keep checking and keep blocking these annoying things! A friend recently updated that because of the barrage of notifications, he has stopped liking or commenting on Facebook. Imagine!! Yes! Shilpa- super post… When I was reading it I remembered that I get annoyed by those things too, and now know what to do about it! Great- off to fix my fb now- thanks dear! The multiple notifications on such posts annoy me too.. I just turn them off. Excellent post..my question has to do with blocking a facebook friend who makes multiple requests for Candy Crush lives..I am probably in the majority here when I say I enjoy the game..However, what I don’t like is receiving 30-requests for additional lives…HELP! Any advice? Very useful tips shilpa, hugs to you, I already started practising a few tips, thanks a ton !